At Currier House, the past is front and center. A new photo wall is on display in the House’s lower level, honoring its namesake, Audrey Bruce Currier ’56, as well as the four alumnae for whom the connecting buildings were named. Currier is the only residence House on campus named solely after a woman (although Pforzheimer House is named for Carol K. and Carl H. Pforzheimer Jr. and their family). Sociology concentrator Xue “Snow” Dong ’19 began the Currier project two years ago, when she was interning with what is now the Equity, Diversity, and Inclusion Team in the Dean of Students Office. She and a small group of colleagues organized a formal dinner for 200 students to celebrate Currier and its unique history. Dong was responsible for making educational posters about the House to display at the dinner (which has become an annual tradition; the next will be held in April), and those posters became “like a prototype” for the new photo wall, she said. The final photos and their accompanying captions were installed at the end of February, in time for the beginning of Women’s History Month. The exhibit will be on display at least until the next academic year, Dong said. It is on view for students and anyone who has a Harvard ID. 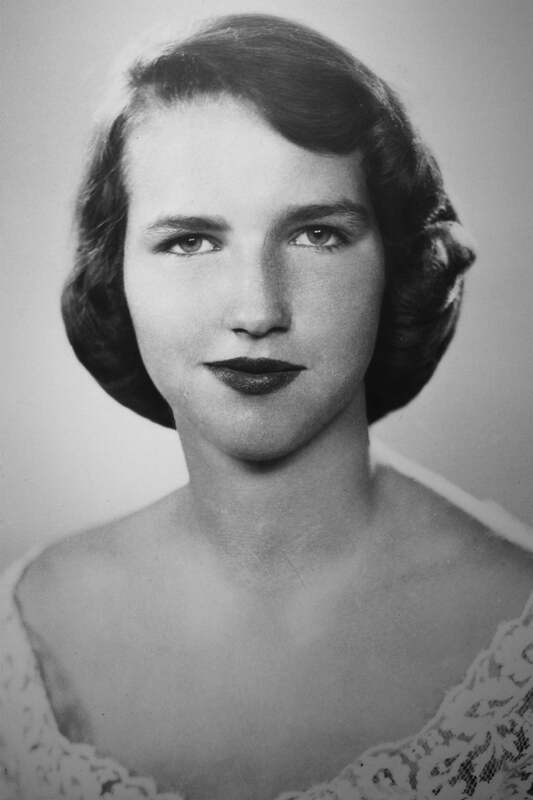 Audrey Bruce Currier ’56 disappeared in a plane crash in 1967. Audrey Bruce was a student at Radcliffe when she met Stephen Currier ’49. Both came from distinguished backgrounds: She was the daughter of David Bruce, an ambassador to Great Britain, and granddaughter of financier Andrew W. Mellon; and he was a descendent of the printmaker Nathaniel Currier, of Currier and Ives. Together, they built a distinguished reputation of their own. In 1958 they established the Taconic Foundation, which sponsored advancements in Civil Rights, education, housing, employment, and anti-poverty programs. In 1963, Stephen Currier asked to meet with the Rev. Martin Luther King Jr. to discuss funding, organization, and collaboration between Civil Rights groups. The Council for United Civil Rights Leadership (CUCRL) was formed and brought together leaders of organizations including the NAACP and Student Nonviolent Coordinating Committee (SNCC) and white donors who wanted to help their causes. CUCRL worked to centralize discussions and debates and helped organize the 1963 March on Washington. Stephen Currier, who donated $1.5 million to the CUCRL through the foundation, was selected as co-chair. In 1967, the Curriers disappeared when their plane vanished over the Caribbean after departing from San Juan, Puerto Rico. The plane’s wreckage was never recovered; neither were the Curriers’ bodies. Currier House opened in 1970 following a $5.4 million donation from Audrey Currier’s mother, Ailsa Mellon Bruce, in honor of her daughter. It served as housing for Radcliffe College and is now part of The Quad that includes Cabot House and Pforzheimer House. Each Currier building is connected by a basement hallway. The wings are named for notable Radcliffe alumnae: musician and composer Mabel Daniels from the Class of 1900, Pulitzer Prize-winning author Barbara Tuchman ’33, journalist and civic leader Mary Bingham ’28, and former chair of the Radcliffe Board of Trustees Helen Gilbert ’36. Barbara Tuchman '33 and Mabel Wheeler Daniels from the Class of 1900. Famous Currier residents have included cellist Yo-Yo Ma ’76, Microsoft founder Bill Gates, who left before graduating with the Class of ’77, Caroline Kennedy ’80, and scientist Neil deGrasse Tyson ’80. As an international student from China, Dong said inclusion is important to her Harvard experience. She said she hopes the photo exhibit will bring greater recognition to Currier’s history. “Even though the history is not visible, the mental priming of knowing this House has a history of women and minority students creates an identity framework where I can feel belonging and comfortable,” she said. She added that as the youngest House, Currier and its cohorts needed further ways to bond. “It’s such a small thing compared to the bigger experience at Harvard, [but] that type of memory about this House will become part of the Currier identity, and that’s something I’m really excited about,” she said. Congratulations are in order after Diana Miao learns she's heading to Johns Hopkins for her residency along with her boyfriend, Brandon Law, background left.